ISO is the third point on the exposure triangle. ISO is a carry over from the old film cameras and stands for “International Organization for Standardization” and is taken from the Greek word “isos”, meaning equal. ISO replaced the older ASA designation. As for how it relates to film, it is an indicator of the film’s sensitivity to light. Light sensitive crystals are an all or nothing proposition. They either react and are subsequently developed, or they do not, and the speed at which they react is the same for any given film. It is more a function of size, but speed is how it’s described. The increase in speed is a result of larger crystals since they are able to react more to light than smaller ones. If this is difficult to grasp, think of them as tiny buckets gathering light. Larger ones gather more, thus producing more image in the same length of fixed time. However, a noticeable increase in the graininess of the image is usually associated with fast film. It is safe to say that doubling the number to 400 ISO from 200 ISO means the film is twice as “fast”. 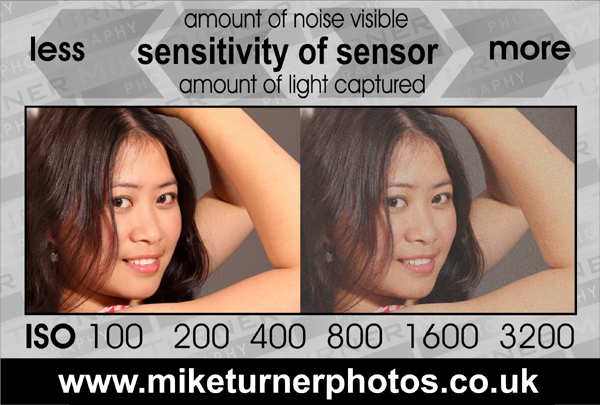 With regard to digital cameras, the sensors sensitivity to light is increased when you move from 200 ISO to 400 ISO, in the same way as film, the image quality deteriorates as you increase your sensors sensitivity, but instead of getting grain, you get a similar effect known as noise. when you move from 100 ISO to 200 ISO you are increasing the sensitivity by double (100%), when you move from 200 to 400 you again double the sensitivity, but each time you do you are inceasing noise in the image. ISO is used to balance your exposure in the same way you would use shutter speed and aperture settings, but would be used to a lesser extent and usually only when you are struggling to find enough light to capture an image at an acceptable shutter speed and when your aperture is open as wide as possible. Now that we have covered all the points of the Exposure Triangle, Shutter speed, Aperture and ISO, my next post will look at how camera meters work. Looking at both, meters built into your camera and hand held meters that can be purchased separately from most good camera shops. If there are any points you would like clarifying please leave a comment and I will gladly address them. For more information about my one to one tutorials in Lowton, Wigan, Warrington follow this link tutorials or hire my studio.